Frequent overnight menopausal hot flashes linked with brain scan changes. Women who experience more hot flashes, particularly while sleeping, during the menopause transition are more likely to have brain changes reflecting a higher risk for cerebrovascular disease, such as stroke and other brain blood flow problems, according to a pilot study led by researchers at the University of Pittsburgh. The team state that more than 70 percent of women have hot flashes, a sudden feeling of intense warmth and sweatiness, while transitioning into menopause. While previous studies have shown that hot flashes can be linked to signs of subclinical heart disease, such as changes in the blood vessels, as well as high blood pressure and elevated cholesterol levels, the current study examined the possible connection between hot flashes and brain health. The researchers recruited 20 women in midlife who were not taking hormone therapy and, using a device that measures skin conductance, biologically monitored their hot flashes for 24 hours. They also conducted MRI brain imaging on participants which detected white matter hyperintensities, these are bright spots on the scan that are thought to develop due to disease of the brain’s small blood vessels. Participants also kept electronic hot flash diaries. In the current study the women reported an average of three hot flashes per day, but the monitoring showed greater frequency, at an average of eight per day as some were likely not self-reported because they occurred during sleep. Women who had more monitor-detected hot flashes, particularly during sleep, also had a greater number of white matter hyperintensities on their brain scans. The team state that other factors like age and cardiovascular risk factors did not explain this effect, so these findings suggest there is a relationship between menopausal hot flashes and blood vessel changes in the brain. They go on to add that further work is needed to understand whether one causes the other, or if hot flashers are a signal of some other vascular process that impacts brain health. The researchers surmise that it might be particularly important for women who are experiencing numerous hot flashes to consider modifying cardiovascular risk factors by quitting smoking and treating high blood pressure. Forebrain activation in the Flash window is depicted in complimentary renditions. (a–c) depicts significant clusters projected onto the cortical surface (depicted from an anterior view). Dorsal prefrontal clusters are visible (a,c) as are clusters in the dorsal anterior cingulate (b). In addition, (d) depicts a mosaic of axial views (z = −16 and superior). Significant clusters overlaid showing comprehensive activations during the Flash interval. Depicted clusters are (1) the bilateral insula, (2) the brain stem, (3) the basal ganglia, (4) the anterior cingulate cortex, and (5) the dorsal prefrontal cortex. 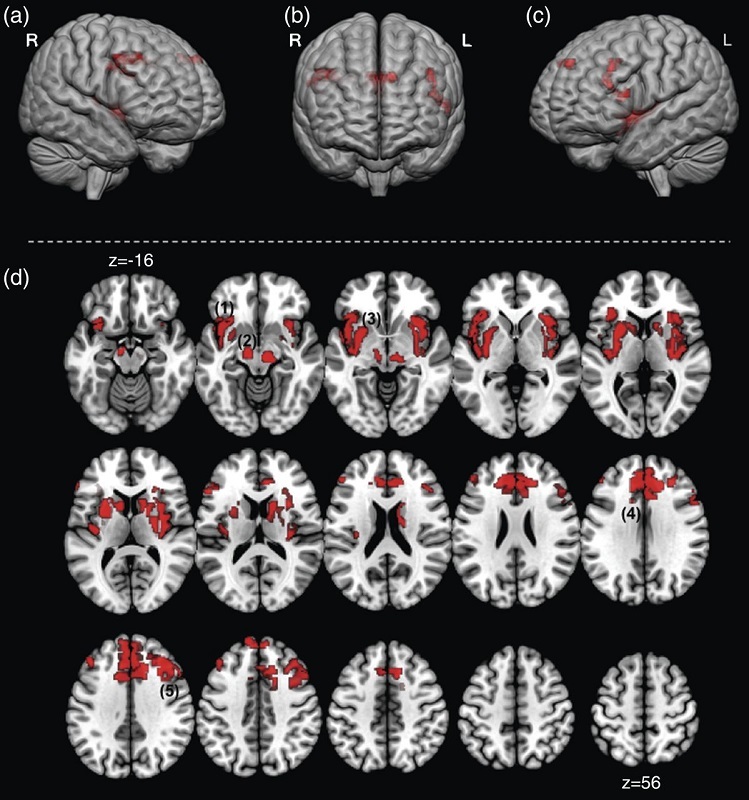 These results in the Flash window depict a network of forebrain regions joining the brainstem (that remains active) during the experience of the HF. These regions have previously been shown to be active in empirical fMRI investigations of noxious heat stimulation and/or are thought to be associated with neurochemical correlates (e.g. dopaminergic) of thermal regulation. This overlap in previous studies of heat pain present an interesting extension of fMRI studies that has been previously undocumented. Temporal Sequencing of Brain Activations During Naturally Occurring Thermoregulatory Events. Diwadkar et al 2013.